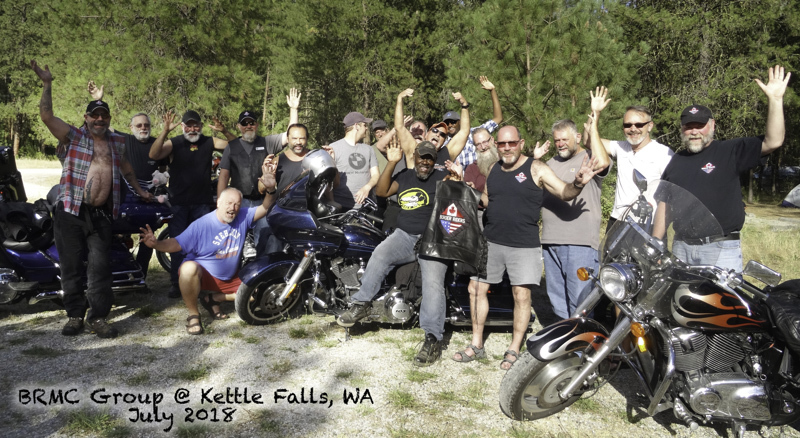 The July run was to Kettle Falls, Washington. It was a long ride for just about everyone, and made longer for some due to Seattle area traffic and various fires causing road detours/closures across the state. In spite of the odds, most of us made it to the campsite to enjoy the weekend activities. As guys arrived throughout the day, tents were setup in sites that looked like they might be under the coveted shade of the tall trees in the area. It was good to relax and get caught up on everyone's ongoings as we got geared up again to head out for dinner 11 miles back down the road to Kettle Falls. Places to eat that can accommodate all of us are few and far between in the town, but we managed to find places that really put out for us for food and service, and good experiences were appreciated after the day's ride. That night, we managed to get a campfire started and enjoyed the evening social until it was time to crash and get some well deserved Z's. The next day we collected ourselves in the morning for a ride into town for breakfast. From there, we broke up into groups for day rides taking us to far off places and sights. For some of us, another long day of riding was not in the cards, so after a much shorter ride, back and camp and into the lake to enjoy the refreshing coolness of the water on a hot day. Later as everyone returned from their rides, we held our group meeting, discussed various business and operational topics, and gathered for the group photo. After gearing up again, it was back into town for dinner and night supplies for camp. Another lovely evening gave us time for more social time and then to hit the sack for the long rides home the next day. Sign indicating the turnoff for the campground. The entrance into the group campsites. Parked the monster after a very long ride to get to the campground. The guys begin to arrive and relax after long rides for all. New guest, Kas, joins us for his first campout with BRMC. Kas joined us for the Portland Pride parade last month. New guest, Christopher, also enjoys the day on his first campout with BRMC. Camping without a campfire isn't camping. We were still able to have one this year as the hot and dry season comes into play. Michael, Dave, and John out for a ride up the river/lake towards the border. Sights along the way. The Columbia River / Lake Roseavelt. Sights along the way. Flame-out! Some of the boys enjoy the cool and very refreshing lake after a day ride and hot afternoon. Kettle Falls is not exactly a hot spot for restaurants. We found one place that served just one thing... chicken and waffles. Yeah, the only difference in menu items were the proportion size. Here, Jeff enjoys a big manly size plate. On the road, Don, Jeremy, and Jason from the perspective of a camera drone flying overhead. It is the end of July already. Damn, where is the year going? July was a great month for riding. I have been commuting on my bike to work. I hate riding up and down I-5 but at least I get to be on the bike. Our July run was great. We had a good turnout. Unfortunately we didn't have more join us. We had a few that didn't make it as well. Jeremy and Jason headed over a day early but Jason had a mishap with a 16 year old pedestrian on the way. They decided to spend the night in Omak and then headed back home on Friday. Jeremy's bike was damaged but still rideable. Guest Daryll 's bike broke down on Thursday before leaving Seattle and he missed out joining us. On a positive note, member Jeff B arrived on his motorcycle. This was the first camp out that Jeff has attended on his motorcycle since breaking his ankle two years ago. Also, it was good to see out secretary John D on his bike as well. He too had not been on his bike much for several months. We had two new guests join us for the first time. Kas, from Portland, rode with BRMC in the Portland Pride Parade and decided to join us in Kettle Falls. This was his first time ever camping. He rode with our treasurer Stan from Portland. He bought some camping gear and borrowed some. For the most part he seemed to be enjoying nature. Hopefully we will see him again. Christopher from Marysville also joined us for the first time. This is his second season of riding and this was his longest ride ever. He rode over with member Chris L and myself. Our road captain Dennis and member Dale C rode with Christopher and I for part of the way home. Early Friday morning Christopher and I met up with Chris L at the Cook Road Shell and headed east on Hwy 20. As we headed down Cook Road towards Sedro Woolley, the skies to the east were very gray and ominous looking. I was afraid we were going to run into rain. We stopped in Marblemount for gas and when we prepared to depart I discovered I had left the key on. The battery was dead. Chris went over to this young scruffy guy that looked as if he was living in his van and asked if he had jumper cables. He did and we tried to jump start the bike with no luck. I tried calling bike shop in Concrete but no one answered. It was shortly after 8:00. We borrowed another set of jumper cables from the store clerk and Christopher unpacked his bike to get to the battery. Why does Harley put the battery under the seat? We had success and after returning the jumper cables and reloading Christopher's bike we headed on east. Next stop was in Twisp for gas and lunch at BJ's Branding Iron Bar and Grill. Can't say the food was that great but the locals started chatting us up as we were ready to leave. Next was a gas stop in Tonasket and on to camp. We arrived in camp around 4:30. After setting up camp we joined the rest of the group for dinner at the BBQ place in Kettle Falls. They had some mighty fine grub. Saturday morning Christopher and I had a late breakfast in Kettle Falls. We shared a table with the "Mayor" and after breakfast returned to camp. Chris L also hung around camp and didn't go for a day ride. We had two guests drop in during the late morning early afternoon and hung around for awhile. Members John D and Michael C returned from their day ride and we spent some time cooling off in the lake. Saturday evening we had the club meeting and followed by dinner in town. We rode into town as one group. It was great seeing everyone riding together. It has been awhile since we had a larger number of bikes all together. And the group actually looked good too! Sunday morning we were up early to break camp. Chris L was going to ride back with us but he was impatient and took off at 6:30. At 7:15 when Christopher and I were ready to leave my bike wouldn't start. The battery was dead again. Dennis, Dale, Micheal and Christopher all helped me try to push start it with no luck. Christopher rode into town and bought a pair of jumper cables. Using Dale's bike we jump started mine. I learned that you can connect to the starter on the bike rather than the battery. At 8:15 we headed for home. We had no problems on the way home. we stopped for gas in Republic for gas, caught up to Dale and Dennis in Tonasket and had breakfast with them. Then a stop in Twisp for gas and a final stop in Marblemount for gas. We said goodbye to Dennis and Dale in Marblemount as Dale had to seek out some ice cream. It was a great weekend. Great roads to ride, great weather and great guys to hang out with. And yes I have to admit, I was rescued not once but twice by a Harley! Hope to see you all at Goldstream! I want to echo what Dave and Stan said about the weekend to Kettle Falls – a great trip, lots of curvy roads, short border crossings for more riding in BC, good food and great company. The campground wasn’t great for privacy and I’m sure we woke up some of the neighbor campers on Sunday, but it was nice to be offered coffee by one of them. It was a great turnout for such a long distance for everyone, had 22 sign up but were a few short of that for various reasons and one early departure. There were 2 new guests and John was back on his bike again. We were able to have a campfire even given the conditions but few night owls around it; everyone tired from the long rides and expecting similar rides home. Looking ahead for planning for next years rides there are 2 moving targets – participating in more Pride events and the 50th anniversary ride. Even though there wasn’t a quorum at the meeting a general consensus was reached on the long September ride. I had also posed some questions in an email regarding Pride events and a few other items, had a number of responses and went over them in the meeting. Look at the minutes for a summary of the replies. Time to start planning for Goldstream Provincial Park on Vancouver Island for this month’s trip as need to account for ferry crossings both ways with several choices depending on your route. The island doesn’t have an abundance of roads to choose from but can expect some good riding. The campground isn’t too far out of Victoria and Chris L will be Road Captain Buddy and figuring out arrangements. Thanks Chris. Wow, what a fantastic campout Kettle Falls was. Those Chicken Waffles, that BBQ place and the roads. I want to go back just for the food. The roads are just a wonderful bonus. Can we go back Road Captain Dennis? PLEASE! Great Job finding that one Mark B. My laptop that holds the club financials finally came home from the repair shop yesterday. I hope to work on it tomorrow but I won’t have it done in time to make this newsletter. ☹ sorry. I will however have financials at the August campout. Another reason why you should attend. Team Oregon and I are working to set up a special class just for us. Only this time it is not their Riders Skill Practice Class “RSP”. This time it is their Advanced Riders Training Class “ART”. I’m so excited I can’t wait. This is the one where they put us on a go cart track and teach us some advanced maneuvers. I hope they yell “go faster, go faster, look where you want to go, go faster”. To prepare for this you should either have taken their RSP class and been invited to take their ART class or be a very experienced rider. If you are not sure, contact me and let us talk through it. The date for this class will be 9/17/18 which is the Monday after the Fossil campout. Unfortunately they have to rent the track and the go cart place is only closed on Monday’s. ☹ sorry. If you are interested contact me immediately at Stanley.V.Christiansen@gmail.com. We need to have 12 people pay before they will schedule this class since it’s after their season for the ART class and they can sell the additional 6 spots to the public if we don’t buy them all. This class is for 18 riders but 12 is the minimum. AND, I only have a couple days to fill it so please contact me ASAP if you are interested. I hope you are having a FANTASTIC summer and I’m looking forward to seeing you at the August campout. We have 8 members with birthdays this month. Please take a moment to wish them a great day.